C. Christine Fair is an assistant professor in the Center for Peace and Security Studies (CPASS), within Georgetown University’s Edmund A. Walsh School of Foreign Service. She has only recently wised up to the opportunity to sell lots of books in India, the world's third largest and currently the fastest growing market for books written in the English language. "Having visited the Indian mission in Zahedan, Iran, I can assure you they are not issuing visas as the main activity! Moreover, India has run operations from its mission in Mazar (through which it supported the Northern Alliance) and is likely doing so from the other consulates it has reopened in Jalalabad and Qandahar along the border. Indian officials have told me privately that they are pumping money into Baluchistan". 1. India's Hindu Nationalists (RSS, BJP) are like the Ku Klux Klan (KKK), the violent post-civil war white supremacist organization made up mainly of former southern confederate supporters, in the United States. The difference is that while KKK has very little popular support in America, the RSS's political wing BJP recently won general elections by a landslide, making Narendra Modi ("KKK wizard") the prime minister of India. 2. India's human rights record in Kashmir is appalling. 3. It's "flat out wrong" to say that "Indian Muslims do not participate in terrorism". 4. Pakistan can use Indian Mujahideen (IM) which includes India's deeply alienated Muslims to conduct covert actions in India with plausible deniability. 5. China has been talking with the Taliban since 1990s. Chinese can play a huge role to stabilize Afghanistan with investments and control Pakistan's behavior. (Later, she says US should encourage India to go big in Afghanistan). 6. India has been able to establish significant presence in Afghanistan under US security umbrella. India's intentions in Afghanistan are not benign. But she also says that US should encourage India to "go big" in Afghanistan to check Pakistan. 7. India has built the Iranian port of Chabahar to compete with Gwadar port in Pakistan. She says Chahbahar offers a better land route for trade with from Arabian Sea to Central Asia. 8. No one wants to pay Afghanistan's bills when US leaves. China can fill the gap. US and China can be partners for peace in Afghanistan. 9. Fair says she is a "personal fan" of India's National Security Advisor Ajit Doval. Fair says "Pakistanis are afraid of him". Fair supports Modi's position of "India not engaging with Pakistan". 10. Current Indian government under Modi can aggressively "over-interpret" as exemplified by recent Indian claim of a "Pakistani terror boat" blown up by the Indian Coastguard. 11. Fair says she wants the US to work to "reduce Pakistan Army's influence"in governance but, in the next breath, she says "civilians are no better than the military". India's Israel Envy: Has Modi Stepped Up Covert War Against Pakistan? NEW DELHI: Mr Jaswant Singh's fight with BJP got nastier on Wednesday, when he compared BJP to the Ku Klux Klan — violent hate groups in the United States that pledge to further interests of white Americans, and who hate Afro-Americans, Jews, minorities, Catholics and labour unions. Mr Singh said BJP has become a variant of the Klan. Mr Singh, who was a 'suspect' in the eyes of RSS, said BJP should cut its umbilical cord with the Sangh. "It is for BJP to reflect on it. To gain their full personality as a political organisation, they have to stand on their own feet. Now they should be mature enough to cut the umbilical cord," he said. appropriated the militant elements of SIMI. backgrounds, especially from the IT sector. socio-economic opportunities for India’s Muslim community. "Times have changed, unlike Manmohan Singh, who kept on taking it and taking it and taking it, Modi is already shown his assertiveness with blowing up a boat." She is also a fan of Ajit Doval or Ajit Devil as he is referred to in Pakistan. Any sign of a terrorist plan against India and Pakistan will rapidly witness another East Pakistan scenario! Jigar: "She is also a fan of Ajit Doval or Ajit Devil as he is referred to in Pakistan. Any sign of a terrorist plan against India and Pakistan will rapidly witness another East Pakistan scenario!" The covert war is a game both India and Pakistan play well. I dont quite fathom why is she so venomously against Pak, not even ajit and modi are that venomous. It has a little to do with money with india and books and all, but may be it is the case of a 'woman scorned'. Senior Congress leader Digvijaya Singh sparked a new controversy on Friday after he compared Prime Minister Narendra Modi to German dictator Adolf Hitler and addressed the Kashmiri separatist Masarat Alam as 'sahab '. "Under what section of the law has the Jammu and Kashmir government arrested Masarat Alam sahab? The government must tell us," Singh said. "What they've said and done amounts to waging a war against the nation. They should be charged under the National Security Act," he said. Alam was arrested on Friday morning in Srinagar ahead of a Hurriyat Conference march to Tral area in Pulwama district following the killing of a youth by the security forces in Jammu and Kashmir. The Congress leader attacked Modi for criticising the opposition Congress during his foreign tour to Canada. "It is the most unbecoming of a Prime Minister to talk about the internal politics of a country. It shows his divisive mindset," he told Headlines Today in an exclusive interview. Modi, in a speech in Canada, had said he is cleaning the mess that Congress left behind. "He must learn that since 1947 till now, no Indian Prime Minister has talked about the internal politics outside the country. Did President Barack Obama talk about his differences with the Republicans when he came to India?" Digvijaya said. When he was reminded of Obama praising Modi in a profile the American President wrote for the Time magazine, the Congres leader said, "Even (former British Prime Minister) Winston Churchill had to take back his words when he praised Adolf Hitler ." On party vice-president Rahul Gandhi's controversial two-month absence from New Delhi, Digvijaya countered, "Please go to Gandhinagar in Gujarat and ask what voters there are saying about their absentee MP, Mr Lal Krishna Advani." Good GOD this lady is painful to listen to, in the vid. US based Terrorism Watch & Warning provides intelligence, research, analysis, watch and warning on international terrorism and domestic terrorism related issues; and is operated by OODA Group LLC that helps clients identify, manage, and respond to global risks and uncertainties while exploring emerging opportunities and developing robust and adaptive strategies for the future.
" ...claims in The Warrior State are contestable on several grounds. maintaining the security competition with India (pp. 18–23). powerful military institution internalized them. " to unseat the PPP government (p. 265). " Since Narendra Modi, a Hindu nationalist and leader of the right-wing BJP party, became prime minister of India in May 2014, groups of radical Hindu nationalists have been terrorising religious minorities across the country. According to a leading Christian rights group, at least 600 such attacks took place between Modi's election and August of this year. One hundred and forty-nine of these assaults were against Christians; the rest were targeted at the country's Muslim community. The attacks, say critics, are being orchestrated by radical groups affiliated to Hindu nationalist and political pressure group: the Rashtriya Swayamsevak Sangh or RSS. Meanwhile, Hindu nationalists have been rewriting school textbooks in some states and holding training camps for teenage boys and girls in an apparent attempt to inculcate children into their cause. We asked Indian filmmaker and journalist Mandakini Gahlot, herself a Hindu, to go in search of those who want a purely Hindu nation and find out what their resurgence means for the future of the world’s most populous secular democracy. In a debate on the Al Jazeera program UpFront in October, Fair butted heads with Pulitzer Prize-winning journalist Glenn Greenwald, a prominent critic of the U.S. drone program. Fair, notorious for her heated rhetoric, accused Greenwald of being a “liar” and insulted Al Jazeera several times, claiming the network does not appreciate “nuance” in the way she does. Greenwald in turn criticized Fair for hardly letting him get a word in; whenever he got a rare chance to speak, she would constantly interrupt him, leading host Mehdi Hasan to ask her to stop. After the debate, Fair took to Twitter to mud-sling. She expressed pride at not letting Greenwald speak, boasting she “shut that lying clown down.” “I AM a rambo b**ch,” she proclaimed. Elsewhere on social media, Fair has made similarly provocative comments. In a Facebook post, Fair called Pakistan “an enemy” and said “We invaded the wrong dog-damned country,” implying the U.S. should have invaded Pakistan, not Afghanistan. In another Facebook post, Fair insisted that “India needs to woman up and SQUASH Pakistan militarily, diplomatically, politically and economically.” Both India and Pakistan are nuclear states. Despite the sporadic jejune Twitter tirade, Fair has established herself as one of the drone program’s most vociferous proponents. Fair is a specialist in South Asian politics, culture, and languages, with a PhD from the University of Chicago. She has published extensively, in a wide variety of both scholarly and journalistic publications. If you see an article in a large publication defending the U.S. drone program in Pakistan, there is a good chance she wrote or co-authored it. After her debate with Greenwald, Fair wrote an article for the Brookings Institution’s Lawfare blog. While making jabs at Greenwald, Hasan, and Al Jazeera; characterizing her participation in the debate as an “ignominious distinction”; and implying that The Intercept, the publication co-founded by Greenwald with other award-winning journalists, is a criminal venture, not a whistleblowing news outlet, Fair forcefully defended the drone program. Secret government documents leaked to The Intercept by a whistleblower show that 90 percent of people killed in U.S. drone strikes in a five-month period in provinces on Afghanistan’s eastern border with Pakistan were not the intended targets. Fair accused The Intercept of “abusing” and selectively interpreting the government’s data. In a followup piece in the Huffington Post, she maintained that the findings of the Drone Papers do not apply to the drone program in Pakistan. As the Narendra Modi government celebrates Sanskrit, a look at the oldest known speakers of the language: the Mitanni people of Syria. After yoga, Narendra Modi has turned his soft power focus to Sanskrit. The Indian government is enthusiastically participating in the 16th World Sanskrit Conference in Bangkok. Not only is it sending 250 Sanskrit scholars and partly funding the event, the conference will see the participation of two senior cabinet ministers: External Affairs Minister Sushma Swaraj, who inaugurated the conference on Sunday, and Human Resource Development Minister Smriti Irani, who will attend its closing ceremony on July 2. Inexplicably, Swaraj also announced the creation of the post of Joint Secretary for Sanskrit in the Ministry of External Affairs. How an ancient language, which no one speaks, writes or reads, will help promote India’s affairs abroad remains to be seen. On the domestic front, though, the uses of Sanskrit are clear: it is a signal of the cultural nationalism of the ruling Bharatiya Janata Party. Sanskrit is the liturgical language of Hinduism, so sacred that lower castes (more than 75% of modern Hindus) weren’t even allowed to listen to it being recited. Celebrating Sanskrit does little to add to India’s linguistic skills – far from teaching an ancient language, India is still to get all its people educated in their modern mother tongues. But it does help the BJP push its own brand of hyper-nationalism. Unfortunately, reality is often a lot more complex than simplistic nationalist myths. While Sanskrit is a marker of Hindu nationalism for the BJP, it might be surprised, even shocked, to know that the first people to leave behind evidence of having spoken Sanskrit aren't Hindus or Indians – they were Syrians. The earliest form of Sanskrit is that used in the Rig Veda (called Old Indic or Rigvedic Sanskrit). Amazingly, Rigvedic Sanskrit was first recorded in inscriptions found not on the plains of India but in in what is now northern Syria. Between 1500 and 1350 BC, a dynasty called the Mitanni ruled over the upper Euphrates-Tigris basin, land that corresponds to what are now the countries of Syria, Iraq, and Turkey. The Mitannis spoke a language called Hurrian, unrelated to Sanskrit. However, each and every Mitanni king had a Sanskrit name and so did many of the local elites. Names include Purusa (meaning “man”), Tusratta (“having an attacking chariot”), Suvardata (“given by the heavens”), Indrota (“helped by Indra”) and Subandhu, a name that exists till today in India. Imagine that: the irritating, snot-nosed Subandhu from school shares his name with an ancient Middle Eastern prince. Goosebumps. (Sorry, Subandhu). The Mitanni had a culture, which, like the Vedic people, highly revered chariot warfare. A Mitanni horse-training manual, the oldest such document in the world, uses a number of Sanskrit words: aika (one), tera (three), satta (seven) and asua (ashva, meaning “horse”). Moreover, the Mitanni military aristocracy was composed of chariot warriors called “maryanna”, from the Sanskrit word "marya", meaning “young man”. The Mitanni worshipped the same gods as those in the Rig Veda (but also had their own local ones). They signed a treaty with a rival king in 1380 BC which names Indra, Varuna, Mitra and the Nasatyas (Ashvins) as divine witnesses for the Mitannis. While modern-day Hindus have mostly stopped the worship of these deities, these Mitanni gods were also the most important gods in the Rig Veda. A Muslim legislator has been suspended in Maharashtra for saying he prefers “Jai Hind” (victory to India) to “Bharat Mata ki jai” (victory to mother India). What the difference between these two declarations is, I am not really sure, but it is enough to merit punishment. On March 19 came a report that Urdu writers have been asked to guarantee they are not writing anti-India material. In today’s India, on the other hand, our ‘nationalism’ is not against another nation. It is against other Indians. This is why it is different. Our great Indian nationalists are rousing passions against their own people, not against another nation. Our fraud nationalists go after their own citizens for their religion, or for their views. Their concern and passion is the enemy within. That is not love of nation. It is hatred and bitterness. Persecution of Indian Muslims and Indian dalits is not nationalism. This word we use so easily as an accusation, ‘anti-national’, is not really current in European languages. Only primitive peoples, like Indians, use it. It means opposition to the things a nation stands for. But who is to decide what positive nationalism is? Other than saying Bharat Mata ki jai, I do not really know what Indian nationalism is. Jawaharlal Nehru University has been organising open lectures on nationalism. This is available on videos that is accessible to the lay person. This is a noble effort but I am afraid that it will be wasted on Indians. It does not matter how terribly you behave, as long as you loudly say Bharat Mata ki jai, you are a nationalist in India. Yet, another story in the papers is about two Muslims, one of them a child of 15, tortured and lynched from a tree, just like African-Amercians in the United States. They were herding buffaloes so it is not clear what their crime was. But it is absolutely certain where the hatred was stirred up.Is this making the government pause? Not at all. The BJP national executive is meeting over this weekend and it is calling for yet more “nationalism”. Haven’t we had enough of that already? Do the people in the BJP know what effect this has on India’s reputation as a civilised society? Pick up any foreign paper or magazine and most of the news about India is negative. Why? Because, as many of us have concluded, avoidable incidents of similar nature are coming with such regularity that it is not easy to escape the suspicion that these things are deliberate. For those hate-filled, fraud nationalists here, achche din have arrived. 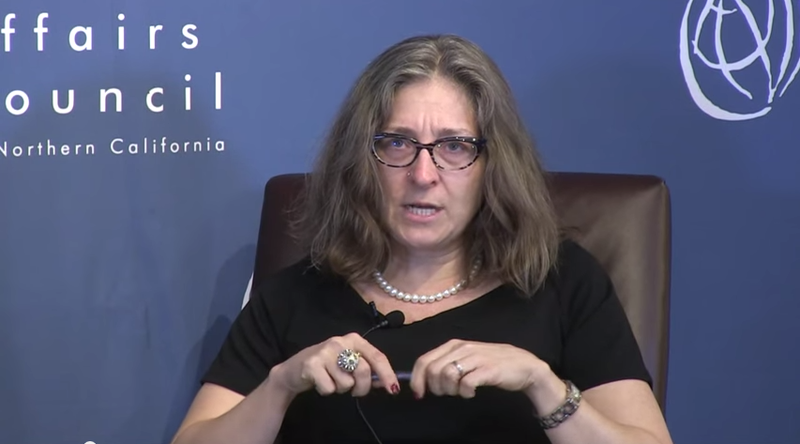 Christine Fair says: "Pakistan is an army with a state rather than as a state with an army". She needs to be more original, not rip off what was said centuries ago about the Prussian Army. Fair is a known Pakistan hater who wants India to invade Pakistan. She praises Ajit Doval for his hawkish stance against Pakistan. She has little credibility. She supports US militarism around the world and proudly proclaims: “I AM a rambo b**ch"
While Akbar and Aurangzeb are attacked for their faults – an easy enough thing to do given how different modern values are from medieval times – Pratap is let off. Temple destruction is a hot topic of debate but untouchability and caste is silently forgotten. Tsunamis of uninformed outrage crash onto the internet over the Mughal treatment of Hindus but there is pin-drop silence on the Rajput treatment of Dalits. If one is objective about using 21st century values to judge 16th century potentates, no one will come out smelling of roses. Akbar made alliances with Hindu Rajputs, who were the backbone of his army – even at Haldighati, Akbar entrusted his forces to a Rajput, Man Singh (who has his own Delhi road). He had a Khatri, Todar Mal, for his finance minister, whose revenue system more than anything, ensured that the Mughals ruled for three centuries. Theological debates were organised by the emperor at a time when religious-driven prejudice was so strong that most Indians wouldn’t even so much as touch each other for fear of losing their jati and "upper" castes thought most of their countrymen subhuman. Jalaluddin, it seems, even left formal Islam, founding a religion called the Deen-e-Ilahi, angering the Muslim clergy – a grudge held till today by conservative Muslims. The clamour to rename Aurangzeb Road was pinned on the man being a tyrant. However, in spite of these spades of liberalness, why is Akbar in the cross-hairs today? The answer is simple: the powerful demand to strike out Akbar Road shows rather clearly that the move to rename Aurangzeb Road had very little to do with the character of Aurangzeb itself. While modern scholarship has shown that the colonial binary between Akbar and Aurangzeb was a false one, making cardboard cut-outs of complex historical figures and administrative systems, at the end of the day, in the public sphere, Akbar or Aurangzeb really doesn’t matter: any Muslim ruler simply has no place in the popular historical imagination as an Indian anymore. "Pakistan is a terrorist predator state. It is a hyena which is the ugliest scavenger. The clowns of Rawalpindi. It should be declared a terrorist state and sanctioned for exporting terrorism. It is dubious and liar state. It bites the hand that feeds it and took billions of dollars to fund the terrorists to kill American troops." Turning to Chinese Ambassador she said that "China should stop supporting this terrorist state." I was absolutely stunned and furious. So I decided to respond to this utterly vulgar tirade. Briefly my response was: "I would like to respond to her who has used such disgusting words. Let me quote one of the greatest military thinkers JFC Fuller. He had said, "The United States has no historical sense. It thinks war is lethal game and whoever has more lethal force wins." I told her, "You compared my country to a hyena. Well hyena has some emotions and can be friendly if treated well. Your country is like a vulture. This bird has no emotions and flies over the entire savannah scavenging carcasses. It has been scavenging on carcasses in South America, Central America, Vietnam, Afghanistan, Iraq, Syria, Libya etc. It has made the entire world unsafe. You just talk about the clowns in Rawalpindi. You have been very economical with the facts. What about your clowns in the CIA and Pentagon? These clowns had no problem to incorporate Rawalpindi in the SEATO and the CENTO to contain the USSR. They had no problems when starting the disastrous Afghan wars. When these clownish vultures didn't require Rawalpindi any more we are called clowns. And please stop giving unsolicited advice to the Chinese. Unlike you they have 4,000 years of civilization behind them. They have the wisdom and farsightedness to do what they have to." The woman was absolutely furious. She was seething with anger. I had achieved what I wanted. She responded angrily and personal attack on me contemptuously calling me that General sitting over there. My response was, please get out of this region. You have created enough problems. We will solve our own problems and peace will come. That added further fuel to the fire. She feverishly started photographing me with her camera and cell phone. She even photographed me while we were having tea. Probably an article against me is coming with my photos. I am certain that I will be indelible in her memory till her grave. Pakistanis (unfortunately less some) after that could walk with a swagger. Fair's work and viewpoints have been the subject of prominent criticism. Her pro-drone stance has been denounced, and called "surprisingly weak" by Brookings Institution senior fellow Shadi Hamid. Journalist Glenn Greenwald dismissed Fair's arguments as "rank propaganda", arguing there is "mountains of evidence" showing drones are counterproductive, pointing to mass civilian casualties and independent studies. In 2010, Fair denied the notion that drones caused any civilian deaths, alleging Pakistani media reports were responsible for creating this perception. Jeremy Scahill wrote that Fair's statement was "simply false" and contradicted by New America's detailed study on drone casualties. Fair later said that casualties are caused by the UAVs, but maintains they are the most effective tool for fighting terrorism. Writing for The Atlantic, Conor Friedersdorf challenged Fair's co-authored narrative that the U.S. could legitimize support in Pakistan for its drone program using 'education' and 'public diplomacy'; he called it an "example of interventionist hubris and naivete" built upon flawed interpretation of public opinion data. An article in the Middle East Research and Information Project called the work "some of the most propagandistic writing in support of President Barack Obama’s targeted kill lists to date." It censured the view that Pakistanis needed to be informed by the U.S. what is "good for them" as fraught with imperialist condescension; or the assumption that the Urdu press was less informed than the English press – because the latter was sometimes less critical of the U.S.
Fair's journalistic sources have been questioned for their credibility and she has been accused of having a conflict of interest due to her past work with U.S. government think tanks, as well the CIA. In 2011 and 2012, she received funding from the U.S. embassy in Islamabad to conduct a survey on public opinion concerning militancy. However, Fair states most of the grants went to a survey firm and that it had no influence on her research. Pakistani media analysts have dismissed Fair's views as hawkish rhetoric, riddled with factual inaccuracies, lack of objectivity, and being selectively biased. She has also been rebuked for comments on social media perceived as provocative, such as suggesting burning down Pakistan's embassy in Afghanistan or asking India to "squash Pakistan militarily, diplomatically, politically and economically." She has been accused of double standards, partisanship towards India, and has been criticized for her contacts with dissident leaders from Balochistan, a link which they claim "raises serious questions if her interest in Pakistan is merely academic." Dharam Pal Singh Bisht stoops to pick up a fresh stack of hot paper from the out tray of his photocopy machine and hands it to a student, who gives him Rs50 — less than $1 — for 100 pages of material. With this transaction and hundreds like it every day, Mr Bisht has single-handedly defeated three international publishers, slashed costs for students at Delhi University, and threatened an entire industry. Mr Bisht runs Delhi University’s photocopy shop, a crowded room crammed with photocopiers and computers where students queue to get their entire course material copied for a fraction of what it would cost to buy the books. Following the decision in March of three international publishing companies — Oxford University Press, Cambridge University Press and Taylor & Francis — to drop their legal case against Mr Bisht, his business is functioning with impunity. The trio claimed his photocopying business undermined their intellectual property, but the Delhi high court ruled that it was not in students’ interests to shut him down. The companies appealed but later dropped the case, citing “longer-term interests”. Executives say they had given up hope of winning, but believed they could still make money in the country long term. India is potentially very lucrative for English-language academic publishers. These include privately owned companies such as McGraw Hill Education of the US and Macmillan Education, which is owned by the German company Springer Nature, as well as publicly listed ones such as Informa — through its Taylor & Francis division — and Pearson. The country is the sixth-biggest publishing market in the world, and the second-largest English-language market behind the US. India has 25m students in 3m schools and, as of 2012-13, 700 universities and 35,000 affiliated colleges. That market is growing quickly, with the population increasing at 1.2 per cent per year and economic output by about 7 per cent annually. Though the companies do not declare how much they make in India, figures from Nielsen, the research group show, that overall revenues in the academic publishing sector have rocketed. In 2013-14, about $2.9bn worth of academic books for schoolchildren were sold in India, and $860m worth of higher education books. By 2015-16, these figures had risen to $4.1bn and $1.2bn, respectively. “Every publisher wants to come to India; there is a huge opportunity here,” says Vikrant Mathur, director at Nielsen. But while the opportunities are significant, so are the hurdles — none more so than the perception of weak intellectual property protection. According to Mr Seshadri, international publishers can expect to make 45 to 50 per cent gross profit margins in India, which translates into 10 per cent earnings before interest, tax, depreciation and amortisation. That compares with gross margins of 65 to 75 per cent and ebitda of 15 to 20 per cent in more developed markets such as the UK. Copyright infringement is not the only hurdle in India. Academic publishers saw their market abruptly shrink by about 18,000 schools in February when the government decided all schools affiliated to the Central Board of Secondary Education should use only state-published textbooks. Meanwhile, ministers have also decided to impose a 12 per cent tax on paper as part of the new national goods and services tax due to come into force on July 1. A 23.1% rate of growth per annum from 2013 to 2017, spectacular!